to play in LF2 this season? The question of the weekend was what is Limoges doing in LF2? A 62-point loss at home is not very comforting for the sponsors and supporters of the club. In another round 9 match, Cavigal Nice suffered their first defeat of the season while Angers appear to be going from strength to strength. You have to feel sorry for Maxime Bézin, the coach from Limoges. He could not have imagined that taking over the role of head coach would be so frustrating. In addition, the injury to Thazina Cook has reduced his offensive options. Limoges are yet to win a game in LF2, with the exception of the ones against the clubs faltered. But before this weekend they had shown some improvement in the last two outings. The first five minutes of the match against COB Calais were okay with Limoges leading (13-12). Calais then stepped on the gas and finished the first quarter with a 17-3 run for a (29-16) lead. By half time the game was over with Calais leading (61-22). Calais won the game (111-47) while having fun with three-point shooting. Aurèlie Cibert led the scoring with 22 points. She connected 6 times from 9 attemps from beyond the arc. Jenny Foussau and Mélanie Devaux did not miss the opportunity to improve their three-point shooting averages with 3-of-4 each. In total Calais scored 42 points alone from beyond the arc (14-of-21) while for the first time this season all 10 players got on the scoresheet. For Limoges Aïda Fall and Iva Grbas combined for 25 points. Angers (UFAB 49) are the most balanced team in LF2 this season. They used a first-half advantage (41-22) to hold off Reims BF (67-58). For Angers all 10 players scored at least 3 points. 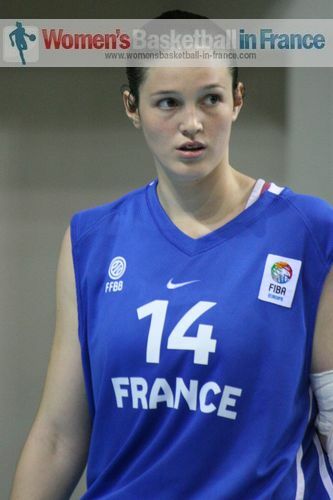 Aurélie Besson top scored with 11 points while Sophie Le Marrec (in picture) and Aurélie Favre had 10 points each. 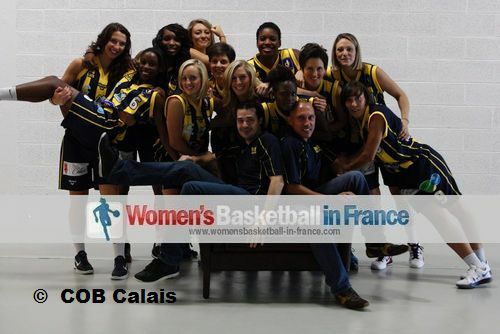 Pau Lacq-Orthez ended the perfect LF2 season of Cavigal Nice (72-66) in a game that had 12 lead changes and 5 ties. The match was explosive as well as physical. Apart from Marion Arfelis all players from both teams scored. Awe Gaye (Pau) and Jeanne Senghor-Sy (Nice) were the only players to have picked up 5 fouls. Pau Lacq-Orthez made home advantage count in the final three minutes as they went 5-of-6 from the free-throw line. 21 points by Ingrid Bunel and her calmness from the charity stripes during the last few minutes made her the player of the match. Fabienne Constant led the Cavigal Nice attack with 17 points. Dunkerque Malo made it two wins in two games with a comfortable victory on the road against the CFBB (80-67). Dace Pierre-Joseph was too strong in the paint and helped herself to 23 points. For the CFBB Katia Clanet was the most interesting player scoring 12 points before fouling out. As usual Illkirch-Graffenstaden like the suspense at home. This time they came out on top against Roche Vendée (73-70). Angers are top of the regular season standing because they have played one more game then Cavigal Nice and Léon Trégor. But all three teams have lost just once this season. In terms of defeats they are just one game ahead of COB Calais, alone in 4th place. These are the four teams setting the pace of the L2F Final 4.